Hanoi (VNA) – Vietnam’s fibre and yarn exports reached 750,000 tonnes, worth more than 1.85 billion USD, over the past seven months, surging 17 percent in volume and 26.5 percent in value against the same period last year. Over 341,000 tonnes of fibre and yarn were shipped abroad for 933.4 million USD in the first half of this year alone, up 18.5 percent in volume and 29.47 percent in value, according to the General Department of Customs. Vietnamese fibre and yarn have been exported to nearly 20 countries worldwide. Of them, mainland China is the leading importer, accounting for 54.4 percent of the total value. The Republic of Korea and Turkey were the two other largest importers of Vietnamese fibre and yarn. Other markets recording positive import turnovers included Taiwan, Hong Kong and Pakistan. 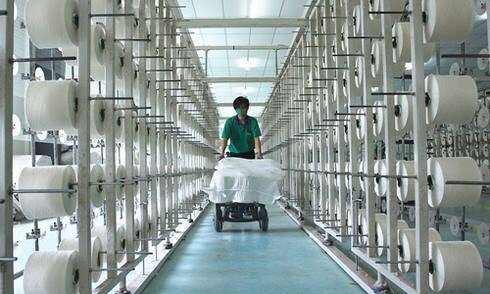 Baodautu.vn quoted the Vietnam Cotton and Spinning Association as saying that Vietnamese businesses have shifted their export targets from Turkey to China and Pakistan after its anti-dumping duties were imposed in recent years.